a variety of resources related to AAC app selection. We strongly continue to advocate for a systematic process for AAC app selection. We recommend AAC app decision making in the context of a feature match process that gives appropriate attention to the full range of AAC options. Training Material on AAC Apps, News, Suggestions, etc. Because this list sometimes gets circulated without the context in which it was originally developed, we decided to include some excerpts from our original post in early 2012. “Graduate student SLPs are a fairly diverse group, but one thing that is common to almost all of them is that they are on a very limited budget. Although many of the AAC apps are reasonably priced, even that can be a lot for a struggling student. 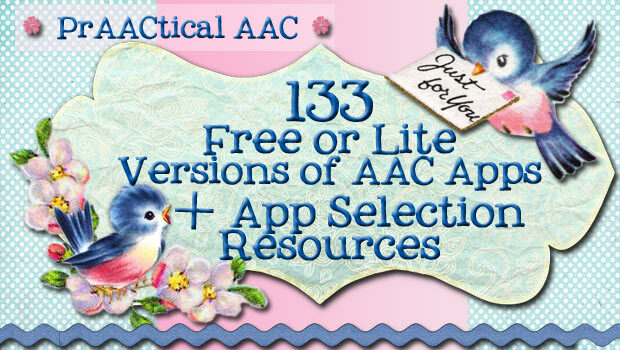 We wanted to put together a list of the free or lite versions of AAC apps for them to explore on their own iDevices. Selection of AAC tools is always made after a thorough assessment. This is as true for apps as it is for speech generating devices (SGDs). This list isn’t intended in any way to endorse these apps or suggest that the free/lite version is sufficient. Hopefully, it will give future professionals a taste of what these apps can do and allow them to begin to think about how to make decisions about this in the context of a feature match assessment. Review sites like the one at Spectronicsand OCALI can be very useful when you are trying to see some of the features that apps contain. This list isn’t comprehensive. If you have links to other AAC apps that are free or have lite versions, please send them along and we will update our list. Learning to communicate with an AAC app requires AAC teaching strategies such as aided language input (ALI), language facilitation strategies, communication opportunities, & meaningful language experiences. Thanks, Jennifer. This post is more than 2 years old, so it is no wonder that the link needs to be updated. I’ll make that change. Thanks for alerting me to the correct URL! Any good communication apps for my Spanish speaking population? Have you looked at JabberTalk Word Board? What do you think?